Give yourself a chance to regain your health! If you have any questions regarding our products and services, you can contact us by phone or by e-mail and we'll get back to you as soon as possible. 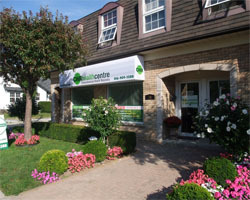 Our clinic is conveniently located at 74 Rebecca Street, Oakville, ON L6K 1J2. There are plenty of parking spots at the back of the clinic. From Q.E.W. West Take the Q.E.W. Eastbound until you reach Dorval Dr, exit and turn right (South). Turn left on Rebecca St and continue until you reach 74 Rebecca St. Our Clinic is located on the right hand side. From 401 West Take the 401 Eastbound until you reach Trafalgar Rd, exit and turn right (South). Continue on Trafalgar road until you reach Oakville, then turn right on Speers Rd, then turn left on Kerr St, and finally turn left on Rebecca St. You will see our Clinic on the right hand side. From Q.E.W. East/Gardiner Expressway Take the Q.E.W./Gardiner Westbound until you reach Kerr St/Dorval, exit at Kerr St right before Dorval and turn right on Kerr St (South). Turn left on Rebecca St. You will see our Clinic on the right hand side. From 401 East/Pearson International Airport Take the 401 Westbound, merge onto the 403 Westbound and continue until it merges onto the Q.E.W Westbound. Exit at Kerr St (Kerr St/Dorval) and turn right (South). Turn left on Rebecca St. You will see our Clinic on the right hand side. Public Transportation From the Oakville Go Station, take the Oakville Transit Bus 17 (Kerr) line, and get off at the corner of Kerr St and Bond St. Walk south on Kerr St until you arrive at Rebecca St. Our Clinic will be located at the South-East corner of Rebecca St and Kerr St.
Click here for Oakville Transit 17 (Kerr) Line Schedule. Click here for bus and train schedules arriving at and departing from Oakville GO Station. Please e-mail to us or leave us a phone message, and we will reply to you as soon as possible.